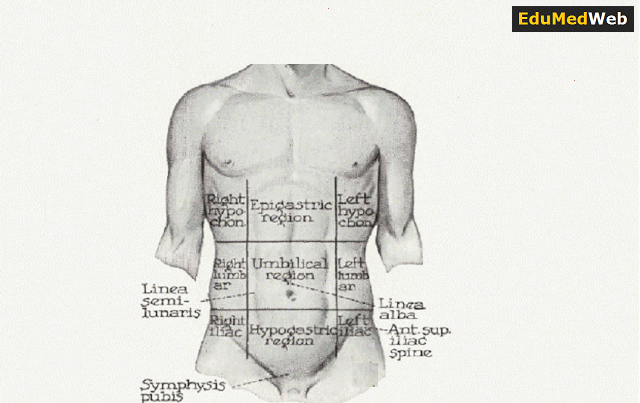 The Abdomen Is Divided into Nine Abdominal Regions By Two Horizontal And Two Vertical Lines. Midline Oval Swelling Above Symphysis Pubis Which May Reach Up to Umbilicus. Normally The Urinary Bladder Is Not Palpable. It Feels Firm Or Elastic In Retention Of Urine. Application Of Pressure Induces Pain And Desire For Micturition. Side To Side Movement Of The Mass Is Not Possible. In Distension, Upper And Lateral Borders Are Palpable But The Lower Border Of The Swelling Can Not Be Reached. It Is Done From Above Downwards And The Swelling Is Dull On Percussion.